Tesla Model 3 wheels have been a point of discussion lately due to the difference of opinion either they are actually ‘wheels’ or ‘wheel covers’. But three wheel patents are now published online for the wheel designs we initially saw at the first Model 3 unveil event last year. Since Tesla has actually filed patents and got approval on all three wheel designs we can be sure that final production Model 3s will have Wheels not just wheel covers over basic rims even if the release candidates have similar looking wheel caps. Also Tesla never mentioned that Model 3 will not have alloy wheels in their Model S vs 3 comparison chart else it would have been a good anti-selling point for them. 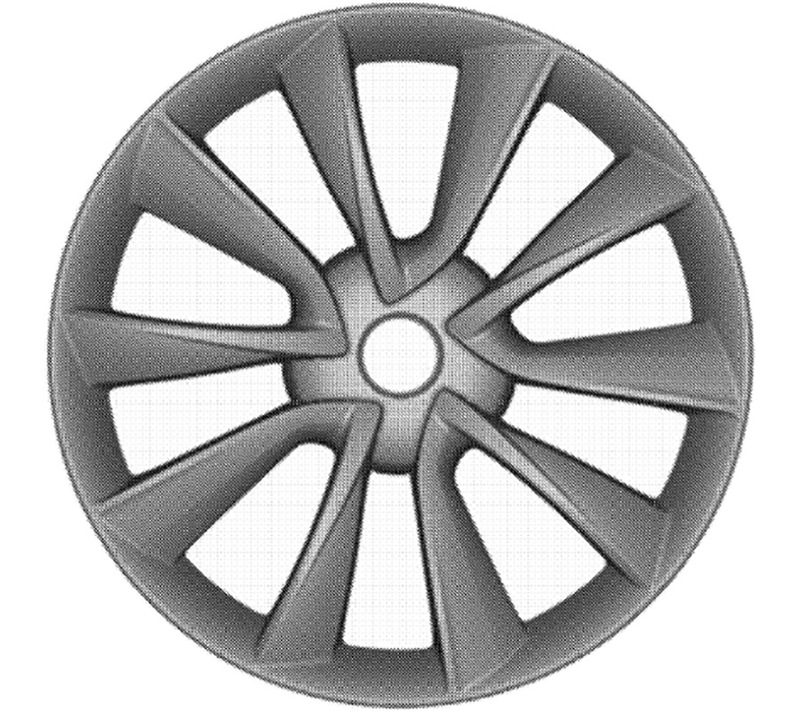 This wheel design first appeared on the Model 3 at the initial unveil evening on the Silver Model 3 prototype. These wheels are the most commonly seen on the Model 3 release candidates spotted frequently for the last few months. The v-spoke terminology is popular among the Tesla enthusiast community referring to the 10 spokes forming 5 beautiful V shapes of the wheel. Let’s compare v-spoke wheel design submitted for the patent by Tesla with the real wheel seen on a release candidate recently spotted at Harris Ranch. Left/Top: V-Spoke wheel design submitted by Tesla for patent and approved on 20th June, 2017 – Link to detailed Patent PDF. 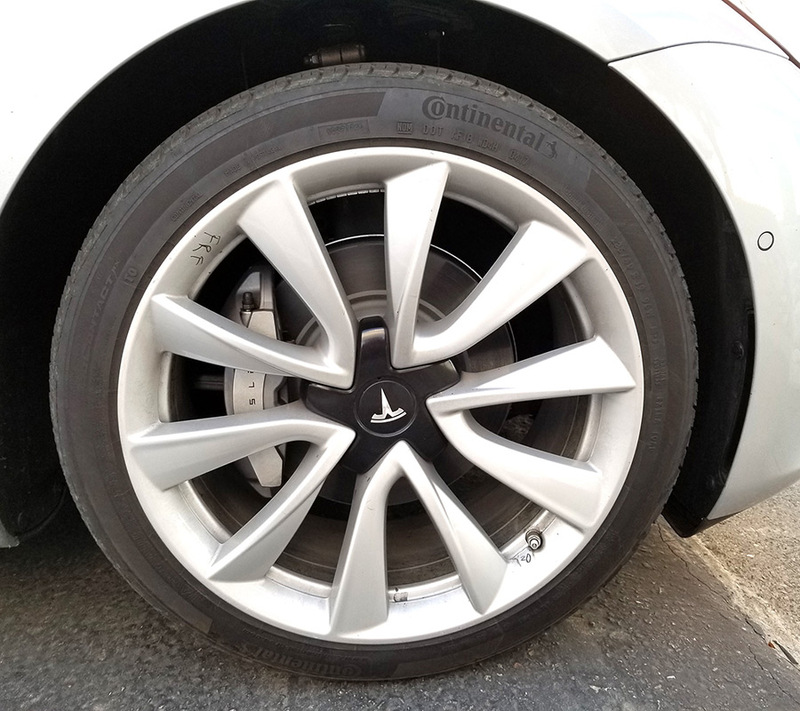 This wheel also made it’s first public appearance at the first unveil event evening on the Gray Model 3 prototype last year, but since than it was never seen in a leaked picture of a prototype, alpha or release candidate. 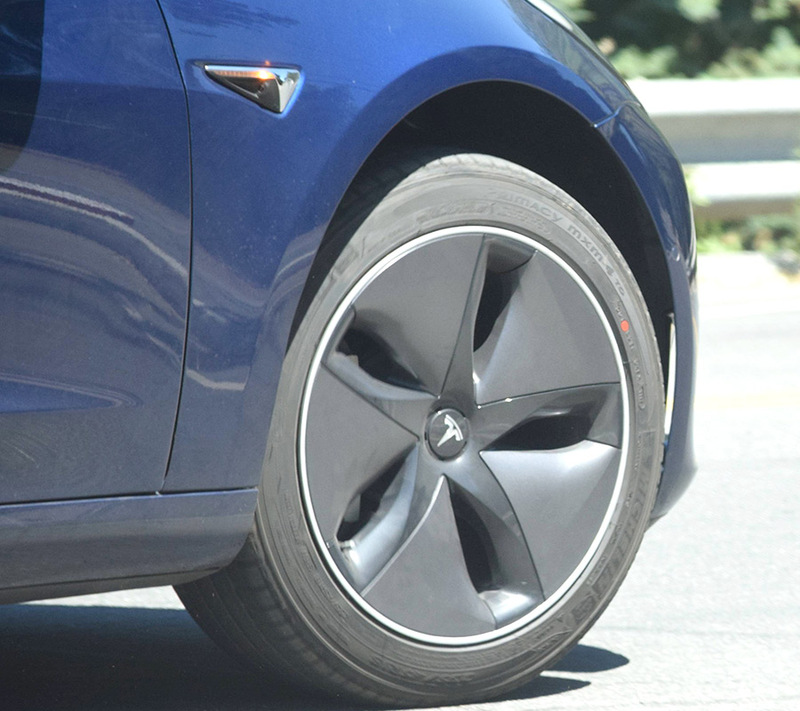 Until the day came when after the VIP Tesla factory tour Andrew Batiuk and Co. found a blue Model 3 with these aero wheels on their spy mission that lead them to a secret Tesla facility as well. Let’s compare the patented design with a Model 3 release candidate’s wheel in the real world. 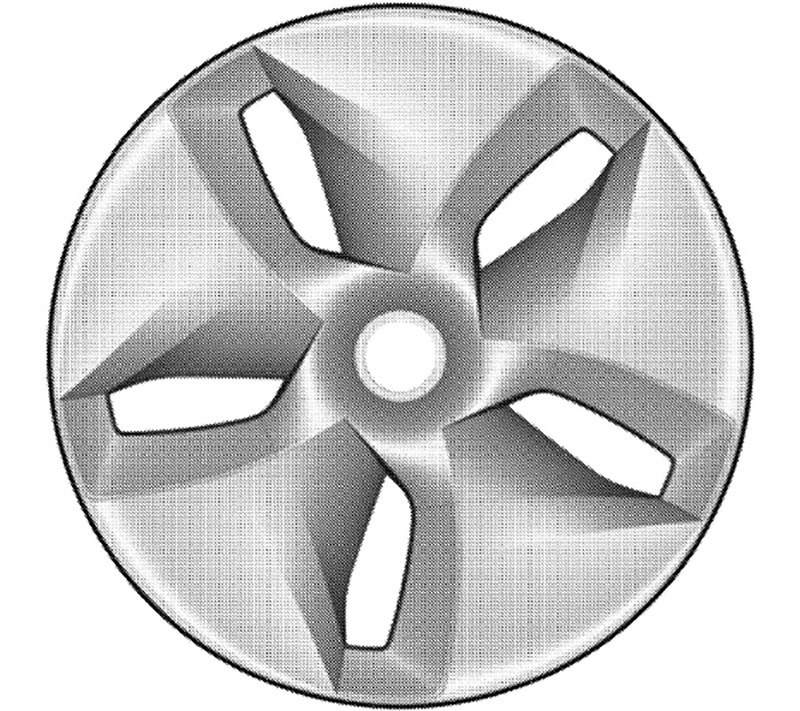 Left/Top: Aero wheel design submitted by Tesla for patent and approved on 6th June, 2017 – Link to detailed Patent PDF. Right/Bottom: Aero wheel as spotted on a blue Model 3 production candidate. More photos by OP on Imgur. 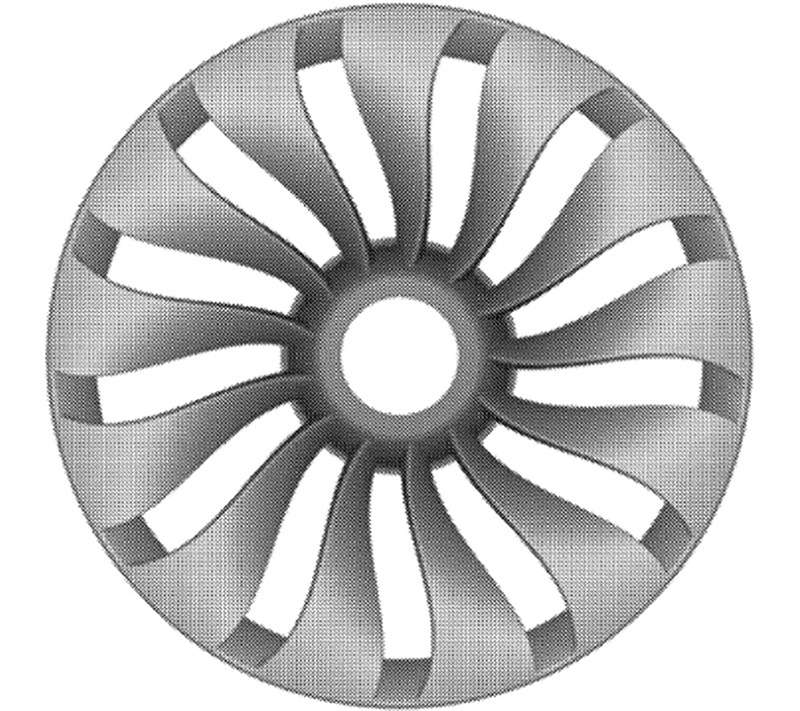 Tesla got the approval on the wind-turbine wheel design as Tesla fans refer to this one (pic below). This design has only been seen on the first Model 3 unveil event last year and has been out of the public eye since. The Model S wind turbine wheel design is much different than this one and in my opinion looks better in comparison but for a $35 k mass produced electric-car it’s not bad at all. Let’s compare the patented design to the only time we saw this on a red Model 3 at the initial unveil evening. Left/Top: Wind-Turbine wheel design submitted by Tesla for patent and approved on 6th June, 2017 – Link to detailed Patent PDF. 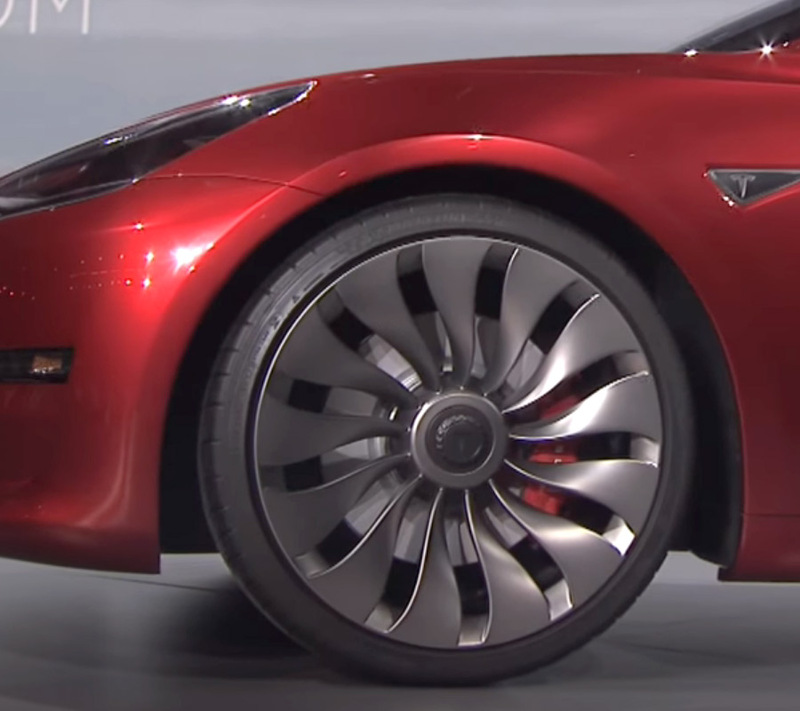 Right/Bottom: Wind-Turbine wheel as seen on a red Model 3 prototype at the unveil event last year. Photos by: Tesla. Definitely all three of these wheels are going to make it to production and most probably the V-Spoke and Aero options will be initially available in the design studio along with 18″ or 19″ option for both. The wind-turbine might be added to the premium options list only available in 19″ option but this is speculation at best, to be 100% sure we need to wait for the final unveil in end of July as confirmed by Elon Musk at the 2017 Tesla Shareholder Meeting. You can shed more light on the matter by contributing your thoughts in the comment section below or like our Facebook Page to stay tuned for future updates. So the designs for Model 3 wheels are at last final ! let’s see if they become available in July when online configurator starts working !